Ann Sharp updated the group on a number of recent and planned improvements in Braddock District, including multimodal paths on both sides of Braddock Road from Rt. 286 to I-495 and paths connecting the Burke VRE Station to nearby neighborhoods. Photo by Mike Salmon, Courtesy of The Connection. 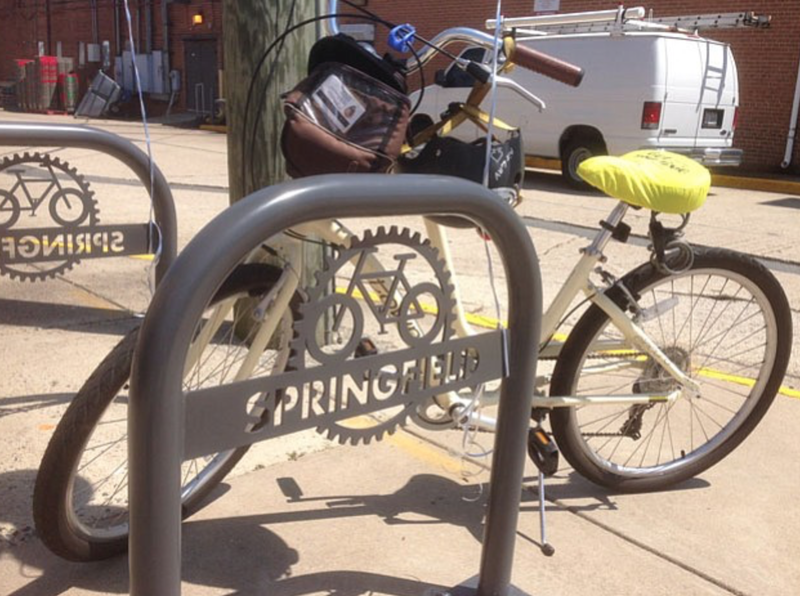 Nancy-Jo Manney shared some of the Greater Springfield Chamber’s bike and pedestrian achievements that have made central Springfield more bikeable. 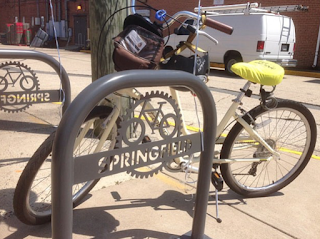 The Chamber has identified and gotten improvements made to a bike route that connects central Springfield, Springfield Plaza, and Springfield Town Center. In addition bike lanes are being added to Commerce Street along with minor improvements on signage, turn lanes, and signal timing in the area. The Chamber also arranged for the installation of branded bike parking at Springfield Plaza and elsewhere with the help of a TransUrban grant that was matched by private property owners. The rack’s logo and design can be used by other communities. A new bicycle and pedestrian Ambassador program has started with three volunteers. The ambassadors will do outreach at public meetings and events to spread a safety message. The VDOT summer repaving program in the Braddock and Springfield districts will add or extend bike lanes on Commerce Street and Braeburn Road. Overall, the county will add 26 miles of new bike lanes this summer. Fairfax County Parkway Trail signage is being designed along with mile markers for the trail between Rt.1 and Rt. 7. Currently, there are 150 bicycle-related signs in the county and this project will add another 300. The Bicycle/Pedestrian Program plans to hire two more staffers this fall. An Annandale to Springfield wayfinding project is underway. 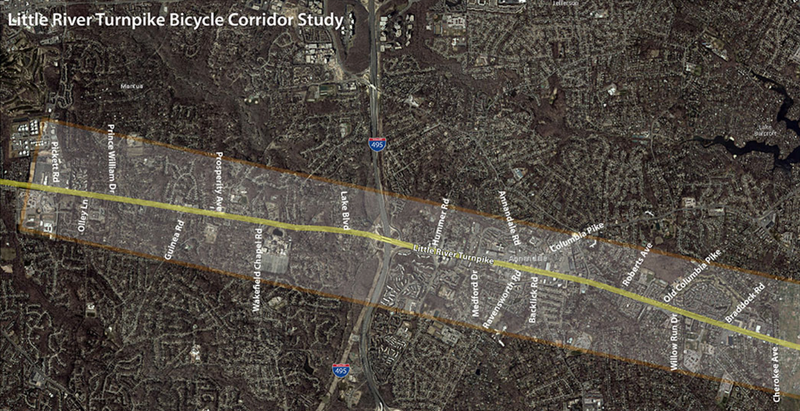 A Little River Turnpike Corridor study is ready and soon will be submitted to the Board of Supervisors for approval. Funding is available for the most important and needed projects in the study. Each of the three presentations included questions and discussions on a variety of issues. One important update shared with the group was the news that VDOT has plans to repave the entire Fairfax County Parkway Trai, in the coming year. Also, VDOT is conducting an inventory of all of the trails in the county to update its database on which trails it owns and is responsible for maintaining. FABB’s monthly meeting are very informative. There is always good discussion, good energy, and good company. Please plan on joining us for a monthly meeting in the coming months. Our next meeting is July 19 at the Patrick Henry Library in Vienna and our August meeting on the 16th at the Mosaic Community Center will be focusing on the Providence and Mason Districts.